104.5 the U is partnering with Big Dipper Ice Cream to send a couple listeners on an overnight trip to Scarywood Haunted Nights! Tune in to 104.5 the U every day this week for the “Flavor of the Day” – and when you hear it text us at 406-800-1045. We’ll accept entries throughout the week and then draw a winner at random on Friday! For those of you who like double scoops, be sure to also head down to the ice cream shop at Higgins and South 6th to put your name in the registration box there. They’ll be drawing a SECOND winner at random the following Friday, Sept. 28th! 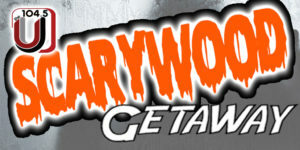 Whether you win on the radio or at Big Dipper, you’ll receive a pair of entry passes to Scarywood PLUS an overnight stay at Triple Play Resort Hotel & Suites in nearby Hayden, Idaho. All you have to do is let us know when you’d like to go, and we’ll make all the arrangements!